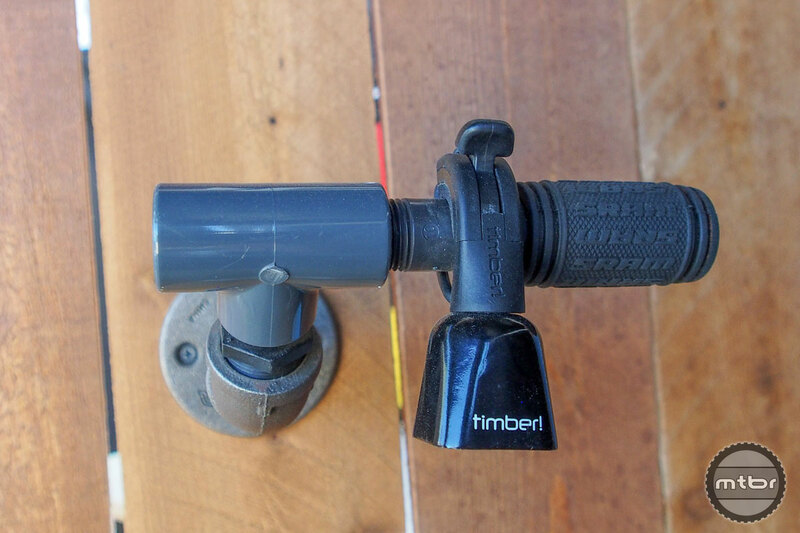 The Timber Bike Bell is made of brass, fits bars up to 35mm, and comes with an o-ring that allows for placement on skinner sections of your bars, too (click to enlarge). What’s the most polite way to alert other trail users of your presence? Most would say a bell of some sort (and not a shout or whistle). But you can make an argument that dinging a bell is the trail version of honking your car’s horn, which isn’t exactly subtle. At least that’s the thinking behind the recently launched Timber Mountain Bike Bell. Instead of the standard ding-ding-ding, the Timber bell aims to mimic the more passive noise of a cowbell. You can check out a video demo here. Once you roll past, toggle the Timber bell back to silent mode and all you’ll hear is your tires on the trail. “The idea is that you flip it into ring mode when rolling up on someone, or maybe on a long downhill run or when going around blind turns where you probably don’t want to take your hands off the bars to ring a traditional bell,” continued Lacy. Lacy says the idea was born during a ride with his wife and Timber co-found Liz when a negative experience with another trail user soured an otherwise fun day. A brainstorming session commenced and soon after they were utilizing a 3D printer to design prototypes. Once design was nailed down they went into production. The Timber Bike Bell is made of brass, fits bars up to 35mm, and comes with an o-ring that allows for placement on skinner sections of your bars, too. It can also be mounted under your saddle on the seatpost. Price is $20. For more information visit www.mtbbell.com. We’ve been using Coghlan’s Bear Bells to do the exact same thing for years up here in AK. They work great to alert trail users and wildlife that you are coming, have a magnetic silencer, and cost less than $5. PolarMonkey, the Timber is much louder and rings a lot easier than Coghlan’s. Excellent bell. Gives the hikers enough time to adjust to me on the trail. Often I receive a thank you as I pass the other person . The ability to turn off the bell makes it worth the money paid. I used to run a bear bell, this is an upgrade. I love this, exactly what I’ve been looking for. To me the cheap bear bells while having a great easy to hear jingle, were just too difficult to silence/unsilence on the fly. I have been using the http://awarenessbell.com/ bell, but I found it difficult to silence while wearing gloves, so I tapped and welded a screw on the bottom so I could wrap some safety wire around it to easily silence it. It works okay but the slight bit of mass I added reduced its aural effectiveness. I much prefer the more technical appearance and sleekness and easily manipulated lever on this bell and its cheaper. I am buying one today to give it a shot. I am definitely sold on wearing a bell its invaluable in the backcountry but also very helpful at local riding areas to encourage in a positive way trail yielding. Of course if everyone at the trail center wears bells they will quit being effective. This is the best warning system on the trail I’ve ever used. I have 6mo of use on mine and it is great. I guess if you have a silent freehub this is worthwhile, but honestly, most hubs are loud enough to easily hear, and if you coast up behind another trail user at anything like a reasonable speed they’ll hear you just fine. Maybe it’s because I also ride a bike, but I’d rather hear the freehub sound than a bell behind me when hiking. TO ME, a freehub’s buzz just says “someone else is using this trail, too”, but a bell says “you are in my way, get off the trail”. Purely a subjective thing though, I’ll be the first to admit. I hope they are successful, even if their product is somewhat annoying to ME. I love this idea and ordered one after seeing it here. My rear hub and bike overall is pretty quiet and I’ve inadvertently snuck up and startled many hikers. I’ve refrained from buying other “striker” type bells as I feel they’re annoying and as of late had just started “fake” shifting to hopefully create enough drivetrain noise to get attention…sometimes this works, but it’s not convenient on some climbs 🙂 I think this passive bell (with an off/on switch) will be perfect for me. Thanks for this post MTBR! I bought this bell after reading the review. Great idea and design. Love how simple it mounted to the handlebar but when you leave it on it’s like Tinker Bell chasing you around buggin’ out in your ear. When it’s on the quietest setting it still felt pretty distracting. My usual ride has a lot of blind corners and switching it on and off was a lot more cumbersome than just dinging a striker bell on demand. Seems like a good idea and a decent price for what they are offering. That CDW awareness bell is crazy expensive but seems very loud. Thing that I am worried about with the Timber Bell is that it won’t be loud enough. I currently run a bear bell on a cramp-on inbetween my brake/shifter cables at the front of the bike and still have people that don’t hear me. Wondering what the dB on these two bells are? Anyone do any scientific testing with either? Funny how the demo video shows the mountain biker just fly by, no brake/slow, etc. Like hey. I got a bell, so obviously it’s not your job to get the F out of my way….?? ?